The SCX10 platform is an already proven chassis-of-choice for scale enthusiasts around the globe. 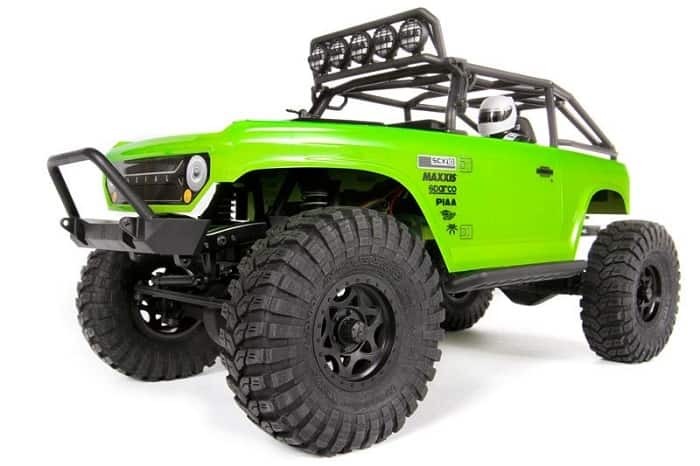 For this new version, Axial has taken the popular Deadbolt body from the AX10 chassis and placed it on the SCX10 which gives it a cool scale appearance and, for existing customers, a new factory body choice. The Deadbolt body with realistic driver figure, officially licensed Maxxis Trepador tires and officially licensed Walker Evans Racing wheels makes the SCX10 Deadbolt the go-to vehicle for realistic scale video action. The axles have been designed with many features that are not available from other products on the market. Everything from the axle strength, pinion angle, caster, and ground clearance were taken into consideration when designing these axles. The result is a far superior axle that will stand-up to some severe punishment. To ensure added longevity from the start, a high-tolerance sintered diff locker is included along with hardened steel axle shafts. In addition to realistic, fully licensed wheels and tires, the SCX10 Deadbolt features realistic scale details like a driver figure with helmet, interior details and a body design with retro inspired lines.